Sorry for the vague question title, I'm not sure how to phrase it more descriptively. The melodic note should be at the top of the chord. The note which is common to both chords should remain the same pitch. Other notes should transition as smoothly as possible. I believe I have followed these rules as closely as possible, except the transition doesn't feel smooth, as (assuming I'm using piano), the right hand must completely lift every finger and assign new keys to each. Question: Is there a better way to complete this exercise? I think your answer is fine. The A keeps its place as a common note, and the F# goes down to the C# just above middle C.
That's fine for piano writing. 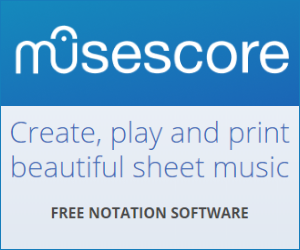 Many of the 'rules' of harmony are about 4-part SATB writing. In that context we could complain about the voice leading I suppose! Here's a version for SATB. Note that I've tried to give each voice some melodic interest. And that, as long as it ends on V, there are many ways of approaching an imperfect cadence, not just I, V.
The A in treble clef gets played in both,(it's the only common note), so your penultimate paragraph isn't accurate. 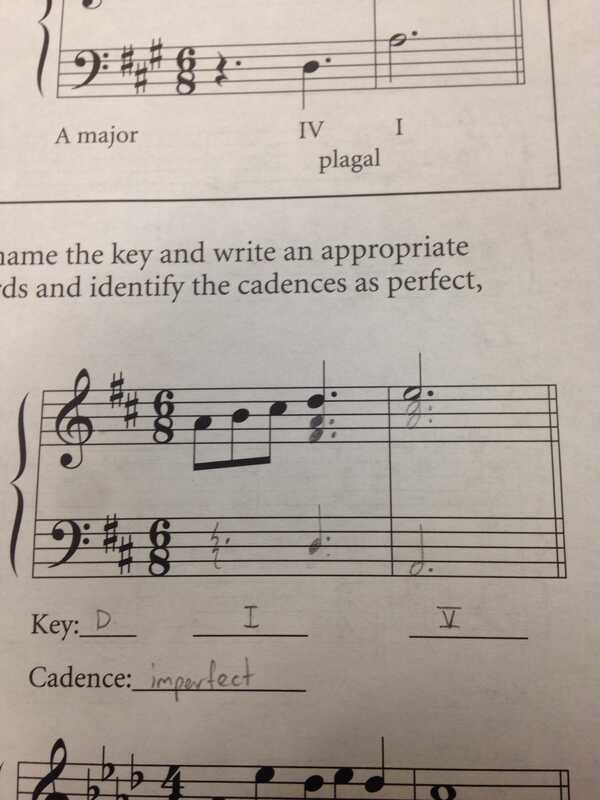 Yes, it's fine, you've gone from a D F# A triad (I) to A C# E (V) making an imperfect cadence. On guitar, the best transition would be to use G (classical music admits 7th chords on V) as the bass note of the chord; which would make it the 3rd inversion but that would move the melodic note which is not what you want. On piano, well, maybe the first inversion, seeing as C sharp is a half-step from D. I'd say C sharp in bass clef, A stays where it is in treble clef and D moves up to E.
Not the answer you're looking for? Browse other questions tagged chord-progressions cadence or ask your own question. What is the name of the chord in this cadence? 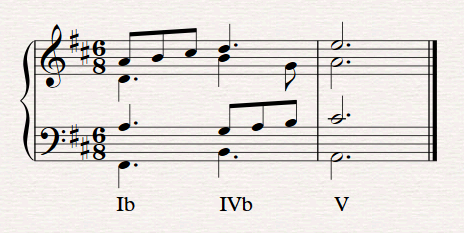 Is the typical use of the N6 Neapolitan chord to lead to a perfect cadence rather than a half cadence? Is this generic cadence chart from Kosta/Payne generally accepted?